Creating one report to meet multiple business requirements can save a lot of work down the road. A common scenario is for different users to ask for similar reporting metrics that may just be variations of existing reports. Using SQL Server Reporting Services, you can achieve this goal with a little planning and creative report design. 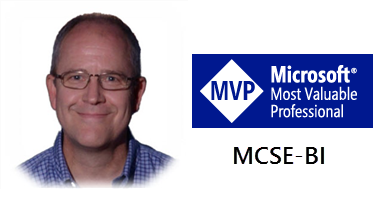 The following technique in Reporting Services for SQL Server 2008 uses a parameterized expression to modify a dataset so that it returns a different set of columns. Conditional logic in the report is used to include only columns in a table which correspond to the columns returned by the query. The same technique will work in earlier versions of Reporting Services but the designer user interface will be a little different. 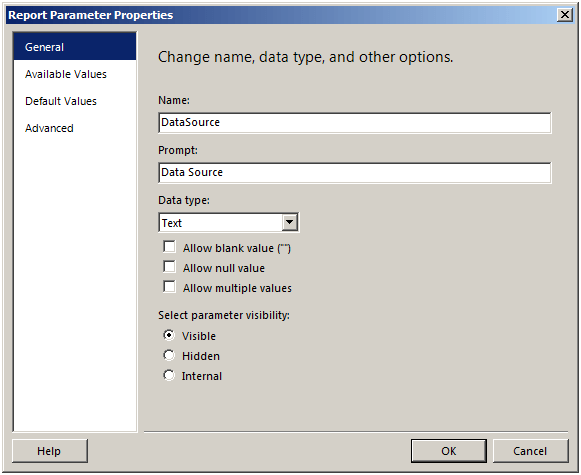 This example uses a parameter to change the stored procedure that will be executed to return the report data. Conditional query logic could also be applied to generate a dynamic SQL or MDX statement. 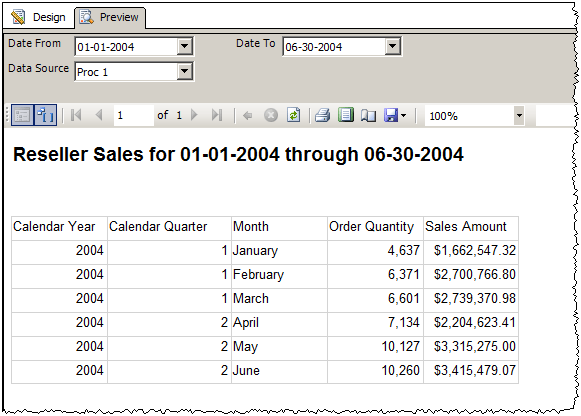 Note that the only significant difference between the spResellerSales1 and spResellerSales2 stored procedures is that the first one returns the CalendarQuarter column and the second one does not. Remember that this is a simple example for the sake of demonstration. You could have as many different procedures or query variations as you like as long as one of them returns all possible columns and the others return a subset of columns in the same order. The report contains parameters, two that will be automatically generated from the DateFrom and DateTo parameters in the procedure, and another parameter named DataSource that I added myself. Note that I’ve provided default values for the DateFrom and DateTo parameters since they’re really not part of the demonstration scenario. 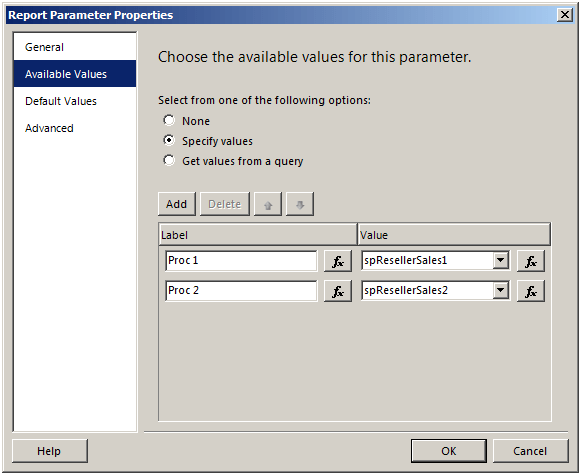 Since the CalendarQuarter column may not be available when the spResellerSales2 stored procedure is used in the parameterized dataset, this column must be hidden when the column is not returned in the result set. This is accomplished by changing the Hidden property of the table column. 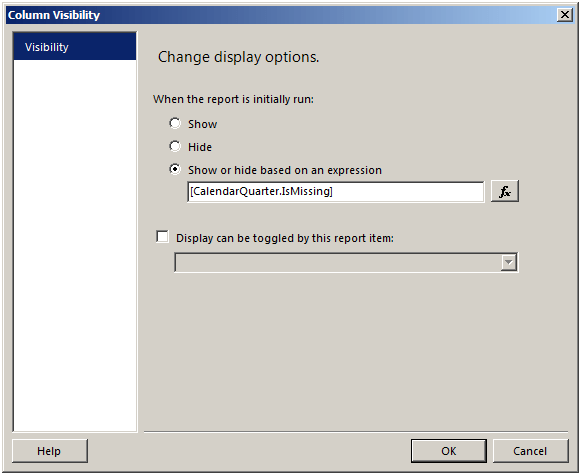 Right-click the column header for the Calendar Quarter column and choose Column Visibility… from the menu. Choose Show or hide based on an expression and then click the expression button to use the Expression Builder to create the following expression for this property: =Fields!CalendarQuarter.IsMissing. Remember that there is a difference between a report dataset and the query that it references. 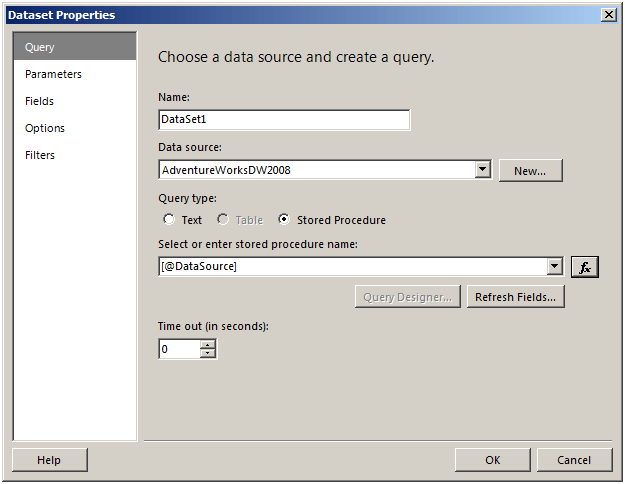 When a query is written, (or in this case, when a stored procedure is selected) field definitions are added to the dataset object and will be there whether the query returns a column or not. If that query doesn’t return a corresponding column for the field, the field’s IsMissing property returns True. 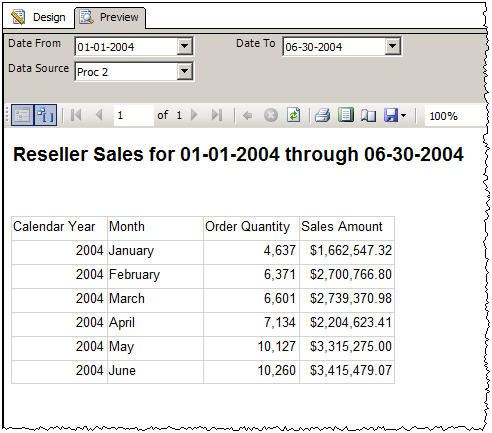 A copy of this sample SSRS 2008 report is included for download.